Woodworm is not actually a type of worm. It is in fact the generic term for the larval stages of a wide variety of wood boring beetles. Some of these are damaging and require treatment, and the most widespread are documented in the “common woodworm types” section. There are also uncommon woodworm types, and that is what we are going to look at here. The uncommon woodworm types that you might come across in the UK are the Waney Edge Borer, the Ambrosia Beetles, the Powder Post Beetle and the Forest Longhorns. The Waney Edge Borer only attacks bark and does not require treatment. To get rid of them it is only necessary to remove the bark. Their damage will often be mistaken for that caused by the Common Furniture Beetle however, but it does not attack the sapwood or heartwood so is not a cause for concern. Their exit holes are approximately 2mm big. 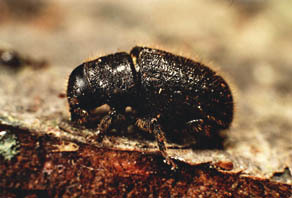 Ambrosia Beetles attack hardwoods and softwoods, but as in the case of the Waney Edge Borer does not require treatment. The reason in this case is that they will only inhabit either standing trees or logs that have recently been cut down. Once the wood has been processed, the infestation cannot survive. Again, however, the damage is often confused with that of the Common Furniture Beetle. You can tell if it is damage done by an Ambrosia beetle by sticking a pin in an emergence hole. If it is an Ambrosia Beetle the pin will go right down into the wood, but if it is a Common Furniture Beetle’s hole, the pin will not be able to go down very far. The holes are usually similar in size to a Common Furniture Beetle’s though, at about 2mm across. The Powder Post Beetle attacks the sapwood of hardwood. It does require treatment if it is found, but that rarely occurs in domestic settings. It is more common in hardwood stores such as furniture factories, or in timber yards. If it is found in the home, it is normally because it has come with a recently purchased item from a hardwood store. It does not attack timber when it is more than 15 years old. The exit holes range in size from 1 to 2mm, and the tunnelling runs across the grain. 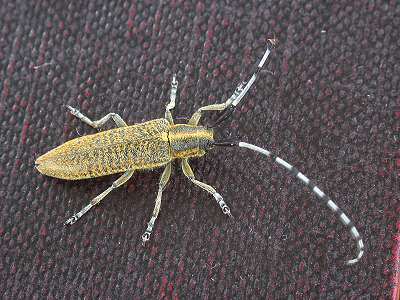 The last of the uncommon woodworm types that we are going to look at is the Forest Longhorn. Hardwoods and softwoods are susceptible to it, but only while the trees are still standing or have recently been felled. 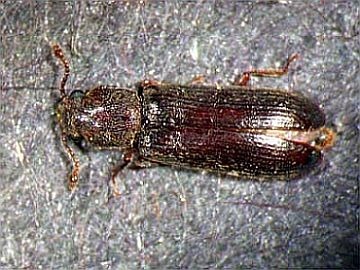 There are actually many types of Forest Longhorns, but as in the case of Ambrosia Beetles they do not require treatment because any infestation will be gone by the time the processed wood has reached your home. The damage is often confused with that made by House Longhorns which may well need treating if the infestation is still present. Their emergence holes are variable in size as there are different varieties of them, but will be oval and no bigger than 10mm in diameter. As you can see, of the uncommon woodworm types there are many different varieties and it can be hard to tell the difference between them and more common types from the damage caused. 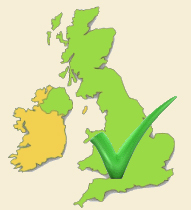 Some need treatment and some do not, so if you are in any doubt then call out a professional pest controller. They will be able to determine if it is a current infestation, whether treatment is required, and if it is, the best course of action to take.